We had Summer's party celebration on Saturday, May 10th at a local park. We reserved the "pre-school playground and pavilion," which consisted of a large covered pavilion and a playground. This is the same place we had Ellie's first party (you can read about it here and here). The weather was a little unpredictable as it called for an afternoon thunderstorm. I debated cancelling it, but decided to keep it on and I'm so glad I did. The weather was hot and sunny until about 15 minutes left until the party ended. Then, there were torrential downpours and storms that passed through. Luckily, we had the covered pavilion and this was the perfect time to sing Happy Birthday and have dessert. This was the invitation I ordered via Etsy. I took the photo in our backyard. Summer has always been such a happy baby and is always smiling. 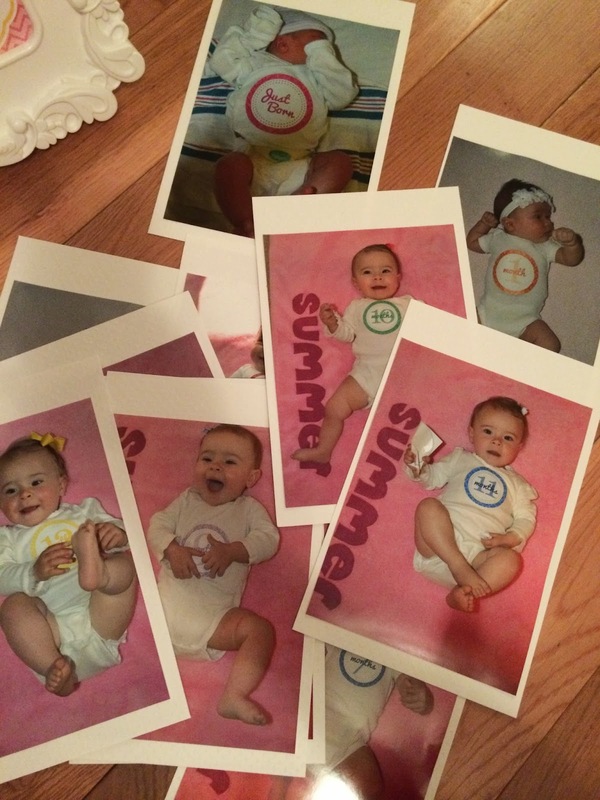 I thought the perfect theme for her first birthday was "Our Little Sunshine." She brightens our days! Instead of gifts I asked guests to consider making a small donation to one of our favorite charities, Save the Children. 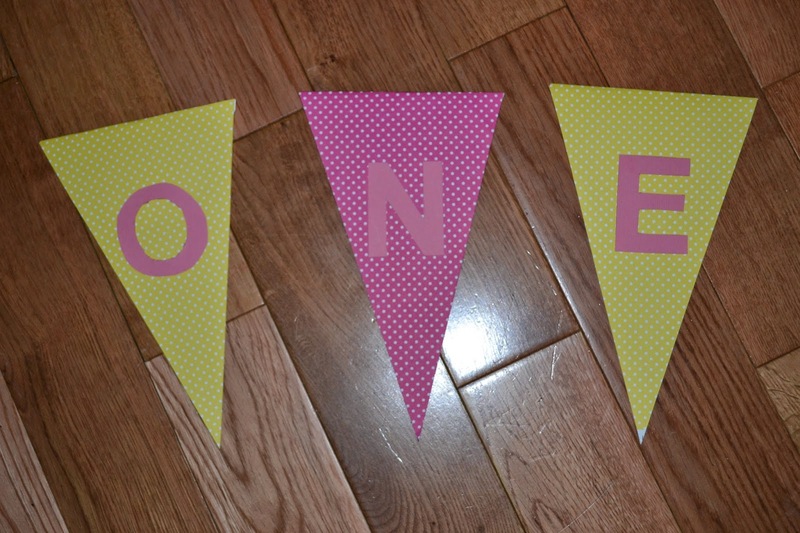 I made a 12-month banner using white patterned card stock and ribbon. I picked my favorite photo for each month and printed the pictures at Fed Ex. I used Rubber Cement to glue the pictures to the paper, then punched two holes and strung the ribbon through the holes. 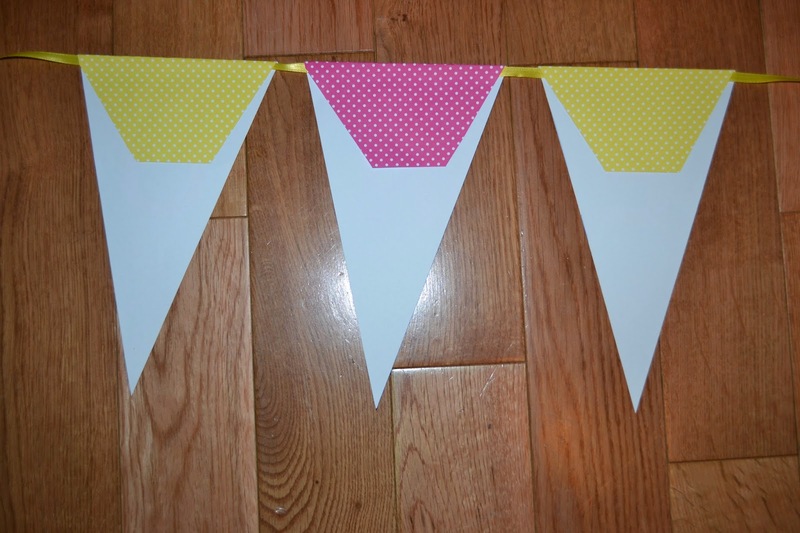 I wanted to try making my own high chair banner so I bought cute polka dot cardstock at Michael's Arts and Crafts, printed alphabet letters I found on Google, traced them onto pink paper, and glued them to the flags. I've seen banners like these on Etsy, but I really didn't want to spend the money. This one came to under $3! I used a ruler and my paper cutter to cut the flags. I got the idea of using sunglasses as favors from Pinterest. I bought two bags at Party City and secured each in a plastic bag with a circle tag with "thank you for brightening my day." I really loved these favors. I found a sun image on Google and created the template on Pages on my Mac. I bought a circle punch at AC Moore and used yellow ribbon to attach to the bags. 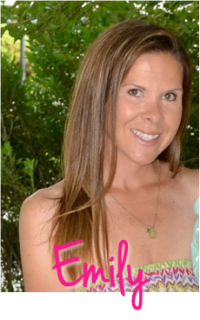 I found a pink plastic container at the Dollar Store to hold the favors. 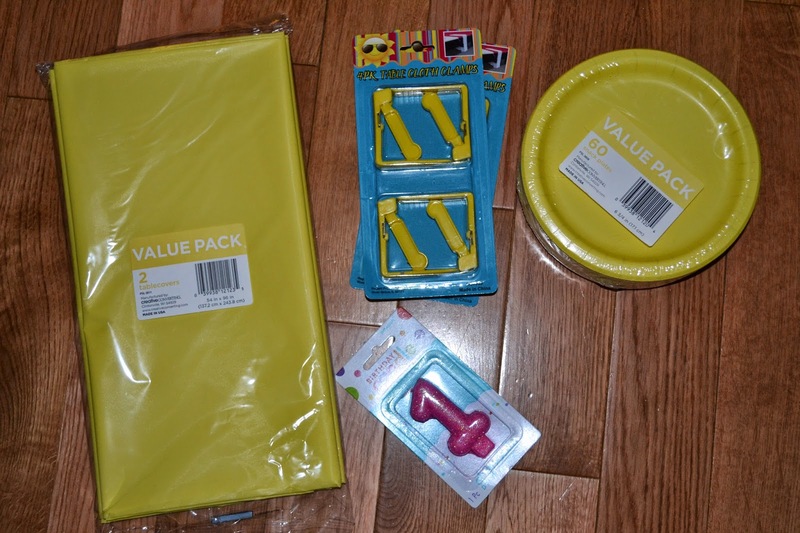 I continued the theme with yellow tablecloths for the picnic tables and yellow dessert plates I bought at Target. We brought two of our own tables for food and dessert and used cloth tablecloths for those. I also had to remember to bring other accessories, such as the candle, lighter, knife, wet ones, paper towels, staple gun, thumbtacks and tape. I was also excited about the first birthday chalkboard sign I ordered from Etsy. I love how it turned out! I ordered it from the shop, Pink Poppy Design. I chose the colors and submitted all of the information and it was emailed to me within 12 hours via a digital file. I printed it at Fed Ex for less than $2. I put it in an Ikea frame I had in my kitchen. 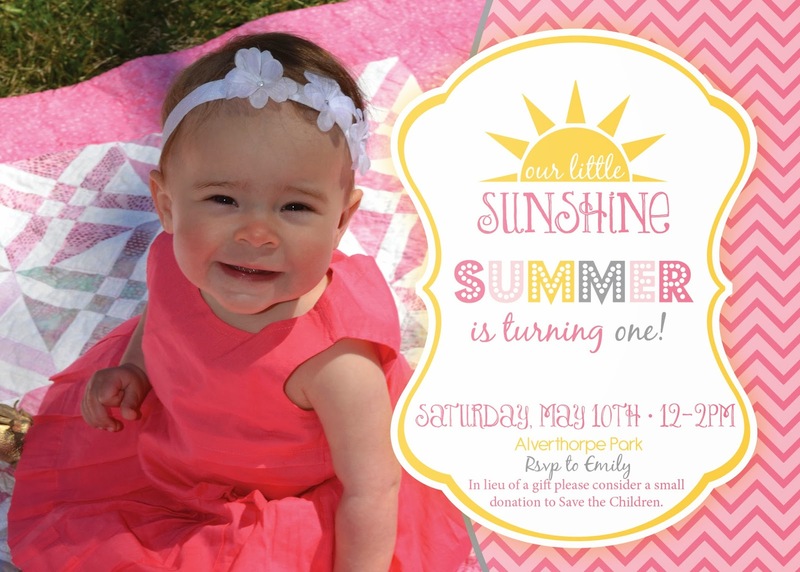 You can read all about her Sunshine Party and see more photos HERE.